BRISTOL - A pair of young stars, New Jersey’s Chris Cartnick and Connecticut’s Ethan Righter, put on a show in the New England and Mid-Atlantic Little League Regionals in Bristol last year. Righter was the ace pitcher for the Fairfield American Little League team. In the final game of the New England Regional, Righter struck out nine South Portland Little League batters to help Connecticut defeat Maine 10-0 and advance to the Little League World Series. Cartnick was on the Holbrook Little League team that went 4-0 in Bristol. His tournament highlight was a grand slam to jolt New Jersey into the championship game of the Mid-Atlantic Regional, where it beat Maryland 8-3 to move on to the Little League World Series in Williamsport, Pa. In Williamsport, both Righter and Cartnick continued to help their teams make a deep run. Cartnick went 8-for-16 with three homers, six runs scored, 11 RBI and a pair of doubles in the Little League World Series. Righter finished 2-0 on the mound in two starts with four runs allowed and 15 strikeouts in 8 1/3 innings pitched. After both played in different tournaments in Bristol, the two faced each other in their first game at Williamsport. It was a close contest that saw Connecticut come out with a 7-6 victory, sending New Jersey to the loser’s bracket. But in the next game, Connecticut fell 6-3 against Texas, forcing it to the losers’ bracket. Facing elimination, Connecticut went on to win a pair of games over Washington and New Jersey, eliminating both from the tournament. The bounce back set up Connecticut with a chance to make the finals. The Nutmeg Staters faced Texas again with a chance to avenge their earlier loss. It wasn’t to be, though, as Texas moved on to the U.S. championship game with a dominant 14-4 win over Connecticut, with Righter unable to pitch. Texas went on to win the U.S. championship 6-5 against North Carolina. Texas lost the World Series championship game to Tokyo’s Kitasuna Little League, 12-2. New Jersey had a strong tournament outside of its two losses to Connecticut. New Jersey beat Michigan 15-5 and defeated California 12-9 in the loser’s bracket before its elimination. 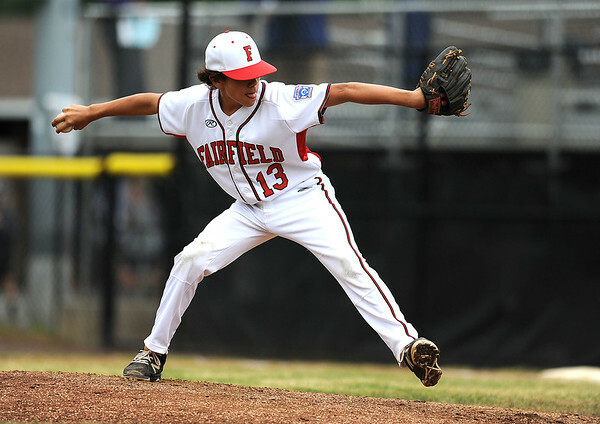 It was the 19th appearance by a Connecticut team in the Little League World Series and the third by Fairfield over the last eight years. Holbrook Little League was the 18th team to represent New Jersey and it was the first time that Holbrook was the New Jersey representative in the World Series. This year’s Fairfield team doesn’t return any of the same players from last year’s group and New Jersey is sending a completely different team. Posted in The Bristol Press, General Sports on Friday, 3 August 2018 20:53. Updated: Friday, 3 August 2018 21:40.